But what does that actually mean ? Like so many industries, motorcycle racing has its own set of jargon which gets a bit baffling to the uninitiated. But there's more to it than that. The meaning of a statement may be perfectly clear, but the significance may not. That's what I'm going to try to deal with here, and we'll update it as we go along. If you can't find an explanation you're looking for then drop us a comment on our Facebook page (here) or you can tweet @MotorbikesToday to get an on the spot (ish) answer. The weather is probably the single biggest variable outside the rider's control. Some circuits are quite predictable. 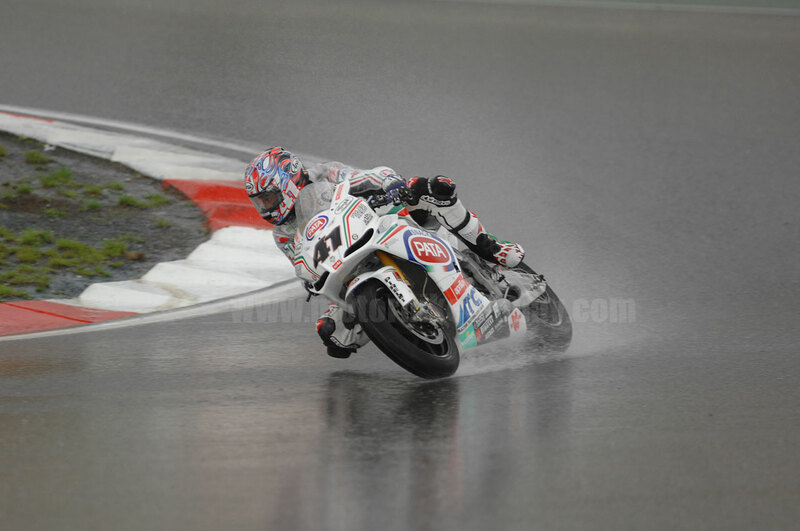 Imola, Aragon, Monza and Misano, for example, rarely experience rain during the summer. 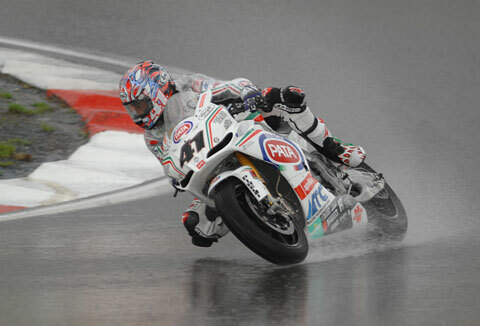 Others, like Donington, Assen and Magny Cours are frequently damp. Though they can also be hot and dry. The biggest challenge for a team is variable weather. If it's raining when they arrive and continues to do so until they leave, at least they know what to expect. But having all the practice and qualifying in the rain and then having blazing sunshine on race day, or vice versa, makes life extremely complicated for the engineers in the team because the bike works very differently in the wet and the dry. In the dry, and I'm massively simplifying things here, you want the bike to be quite stiff. There is more grip to play with, so both braking and acceleration are more violent for a start. So to minimise weight transfer, and give the rider a sporting chance of keeping both sheels on the ground some of the time, the suspension is set to be quite hard. At the same time, you want the best feel you can get because although the bike will move around a little, it's relatively well planted on slick tyres and so again harder suspension will give the rider more feel as to what's going on where the rubber meets the road. In the rain, the bike skates around all over the place. Braking and acceleration are relatively gentle, so softer suspension gives the rider an easier time. 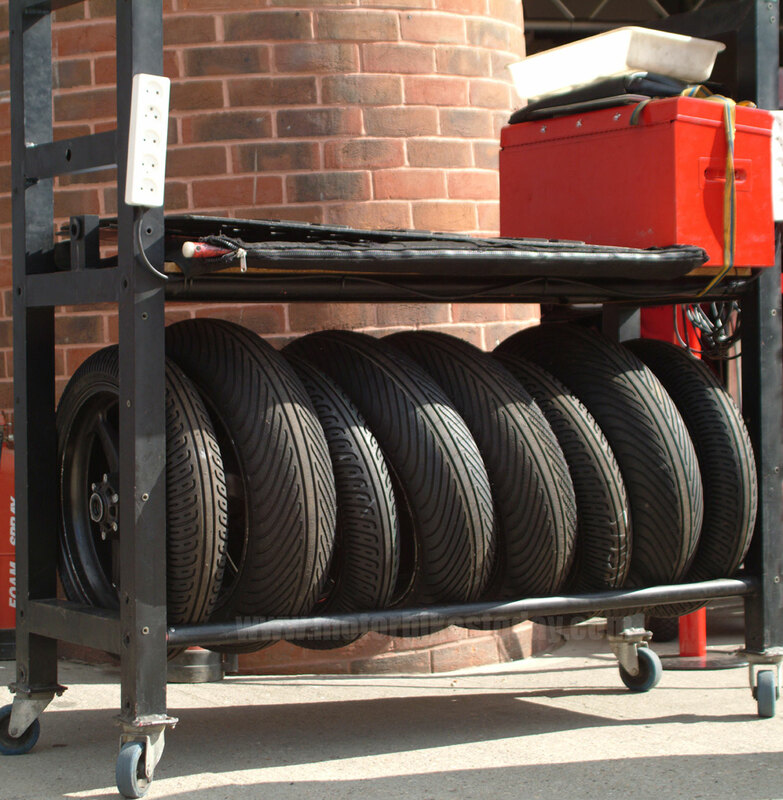 Additionally, this setup allows the suspension to do the work of absorbing bumps and dips rather than letting the tyre to do it (or,indeed, simply allowing the tyre to skip slightly over a dip or crest) which becomes important when there isn'tenough grip to make a quick recovery a foregone conclusion. In the dry a tyre may well break traction a dozen times a lap without the rider really even having time to register before it hooks up again. In the wet the consequences can be far more serious. Temperature makes a huge difference as well. A cold track doesn't, generally, offer the same level of grip as a hot one. It is also generally easier on tyres as they don't get as hot. As a result, softer tyre compounds which offer more grip are usually used for colder track surfaces. We'll look at them when we get onto tyres. Surprisingly, wind makes a big difference as well. Take somewhere like Phillip Island, where it's notoriously blowy. There's a long main straight there, and sometimes you'll find a massive headwind that really knocks the top speed down. But conversely, you might get a twenty miles per hour boost from a strong tailwind. That means that as well as arriving at Turn One a lot quicker than you might expect, you also have this wind working against your brakes. And it really does make a huge difference. You can also be blown off the bike, especially if you find yourself leaning into the wind to take a turn. The air gets under you and the bike and lifts just enough to reduce your grip and tip you off. Unconvinced? Ask Troy Corser, who had that very thing happen in qualifying at Donnington a few years ago. It all relates to everything above, really. But to oversimplify again, there are a few basic changes that cam be made to the way a bike is set up. At the front, you can adjust ride height by moving the forks up or down in the yokes and/or messing around with spring preload or stiffness. You can adjust damping rates, both for compression and rebound, and you can adjust tyre pressure. Same at the back really, you can adjust ride height, tyre pressure and damping. Sometimes you can adjust the swingarm pivot height as well, though that's unusual on Superbikes. You can also adjust gearing, both by changing the sprocket sizes and by changing the entire geabox cassette, though that's usually the province of works or well funded satellite teams. 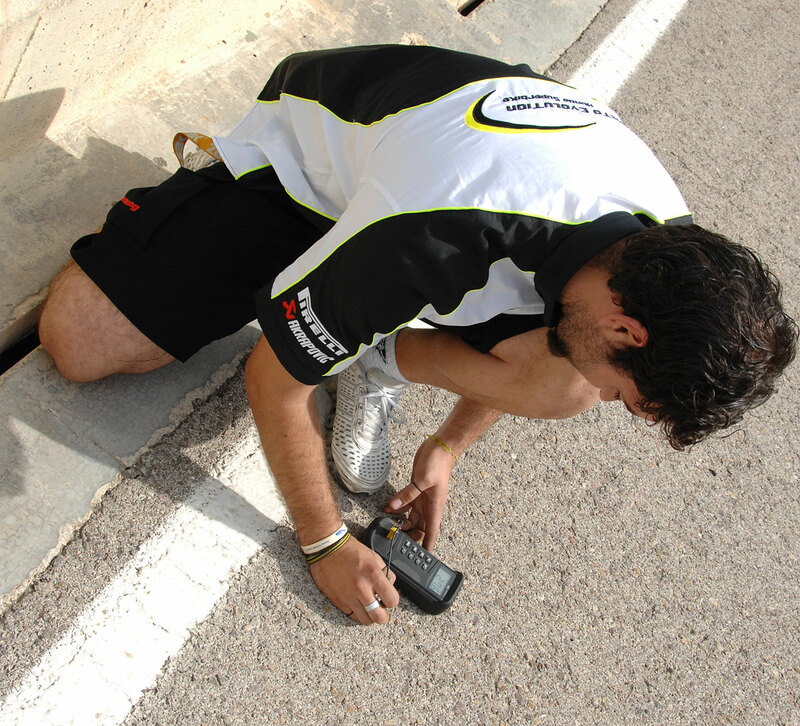 Ideally, a team will have experience at a circuit before race weekend, either from earlier seasons or from testing. This gives them what's referred to as a base setting - something to start with and refine. Otherwise it's guesswork from the off and though it can be done, setting a bike up from a pretty random starting point takes more time than is usually available on race weekend. So from their base setting a rider may request sharper steering, better acceleration, whatever. The chassis technician will take the rider's comments and the information from the bike's onboard datalogger to make some adjustments and hopefully make the bike and rider go faster. All the settings are logged throughout the process, partly to ensure that there is always a baseline to work against and partly to make sure thta on the next visit there will be setup data to use as a baseline. Of course, everything changes if the weather changes during the weekend. If you've been to, say, Monza in the rain before and it rains then you've got a baseline, But if, like most people, you've only seen sunshine there, well you have to start from scratch. It's also worth noting that bikes, as well as tyres, change each season, so baseline data is very rarely on the money first time. It's just a line in the sand to work from. Black round things that stop the wheel rims from sparking on the ground and wearing out. Tyres are probably the single thing that I'd point at as having changed the most over the last couple of decades, and are certainly the single biggest contributor to the ongoing announcement of new lap records in all race classes. Most top flight race series these days are supported by or affiliated with a single tyre manufacturer. MotoGP has Bridgestone, SBK has Pirelli, for example. And in an attempt to reduce costs and make the playing field a little more even, tyre choices available are now reduced from the bewildering options we had a few years ago. Essentially now there are six tyre options now. Slicks, intermediates and wets, with hard and soft compounds in each. Barring manufacturing issues, all the tyres of each type are the same, so nothing is bespoke for a particular bike. Slick tyres have no grooves on them. They give ultimate grip in dry conditions, but are lethal at the first sign of any surface water as they don't have any tread to clear the film of water that will form between them and the track. Intermediates are essentially slicks with some tread cut into them for use on a damp track, while wets are heavily treaded and are only good for proper rain. There is a fourth type of tyre, and that's a production tyre, often simply referred to as treaded. 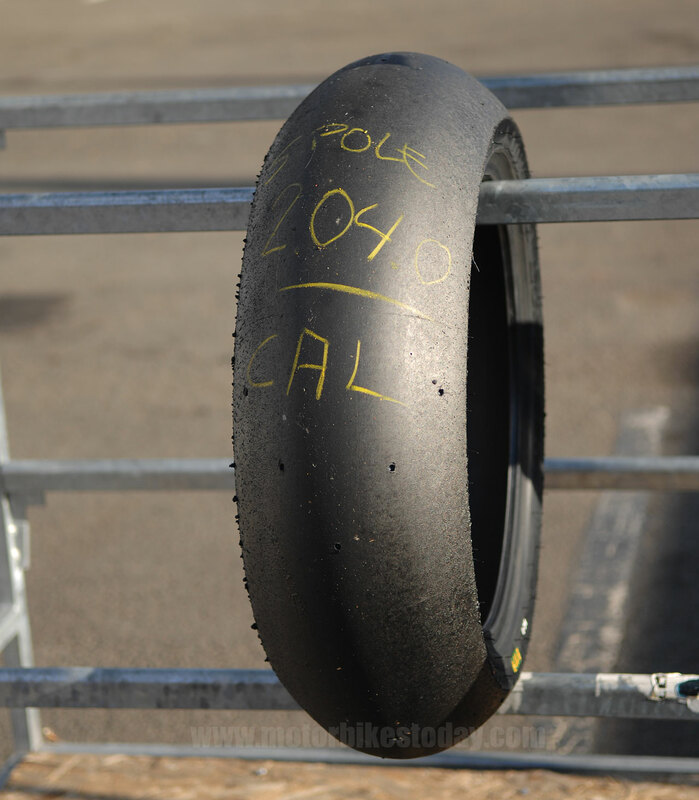 This is a road legal tyre, normally only available in a single compound, and it's used in Supersport and Superstock racing where slicks are illegal. Tyres arrive with a shiny surface from the moulding process, and they need a bit of friction to get a properly grippy surface presented to the track. Normally the positioning lap and the warmup lap are enough to at least give the rider a sporting chance of having enough grip at the first corner. That and the use of tyre warmers to keep them at or close to optimumu temperature, of course. Sometimes a tyre will turn out to be bad. The most common problem is that, for some reason, the tyre won't scrub in. The rider will never get decent grip and can come in after twenty five laps with a tyre that still looks new. There's no way of telling if a tyre is going to have this problem until it's being used, and perhaps one in two or three hundred tyres may suffer from this. Though they look simple, there's a lot of careful design involved with tyres. They have an optimum operating temperature. Too cold and grip tails off sharply. Too hot and the same happens, along with a rapid increase in wear. The way a tyre is put together affects its rigidity, which in turn affects how it deals with bumps and direction changes. The actual rubber used alters the operating temperature, the way the tyre wears and the way it grips under different conditions. A lot of tyres are made from more than one compound, with harder rubber in the centre where grip can be traded for longevity and softer, stickier rubber on the shoulders where grip is key. You'll hear a lot of things relating to tyres in race reports, the most commen being that the tyre has gone off or gone away. Race tyres are not intended to last very long. Ideally they should be completely wrecked at the end of the race, unable to last a single lap more. But that would be silly, because of course as they wear they lose grip. In fact, they lose rubber onto the track, and one of the effects is that with less material to dissipate heat they got hotter still, losing more material as a result until they are completely shot. That's the real test of a rider's skill, and the fundamental setup of the bike - still maintaining a good pace when it feels as though your tyres have been greased. One other thing. Treaded tyres generate heat by the movement in the tyre carcass allowed by the treads. Wets have a lot of tread, so they generate a lot of heat. Run them on a dry track and they will melt, literally, in a few laps. Chatter. Not what racers do when they're waiting for stuff to happen. Well, not in this case, anyway. Chatter is a suspension problem. In the simplest cases, it comes from the front forks being over-damped. This means that the suspension can't react in time to deal with changing loads, so it effectively locks and makes the wheel skip. It doesn't actually do that, but it's how it feels. It's horrible, robs the rider of confidence in the bike and massively increases wear on the front tyre as well. The trouble is that while we assume that the suspension workload is all taken up by the forks and rear shock, the reality is that other elements play their part too. The tyres, of course, add a definite suspension component as they compress and flex. But, increasingly, the frame is designed with a controlled amount of flex as well, partly because a slightly flexible frame feels better and gives more feedback. So if the frame is ultra rigid (like, for example, the MotoGP Ducati) then the forks in particular have to work harder to give feedback to the rider and to control things. I wonder if it's any coincidence that chatter has plagued Ducati since their adoption of the monocoque chassis? Copyright © Motorbikestoday.com 2012. All rights reserved. Users may download and print extracts of content from this website for their own personal and non-commercial use only. Republication or redistribution of content, including by framing or similar means, is expressly prohibited without the prior written consent of Motorbikestoday.